Using the CodeBroker mobile marketing platform, you can set up mobile campaigns and make them available to your customers within minutes. CodeBroker’s mobile marketing software generates barcodes that can be used with digital coupons, loyalty cards, reward certificates, and gift cards. No system integration with your store point-of-sale is required. Using our one-time-use mobile coupons you can track your marketing efforts from call-to-action through redemption. You’ll have a complete picture of your campaign using CodeBroker’s mobile marketing solutions to track who received promotion information, who viewed it, and who used your digital coupon. Start your mobile marketing programs instantly. Program set-up, testing and deployment are fast and easy. Within minutes you can begin delivering offers. Increase your reach by delivering promotions to your customer’s preferred delivery channel(s) such as SMS, mobile web, retailer’s app, email, social, Apple Wallet, or online shopping cart. Speed up the path to purchase by delivering and tracking promotional information through different coupon models including one-time-use coupons, multi-use coupons, load-to-card, and more. Speed redemption time through patented technology designed to optimize bar codes on mobile phones. 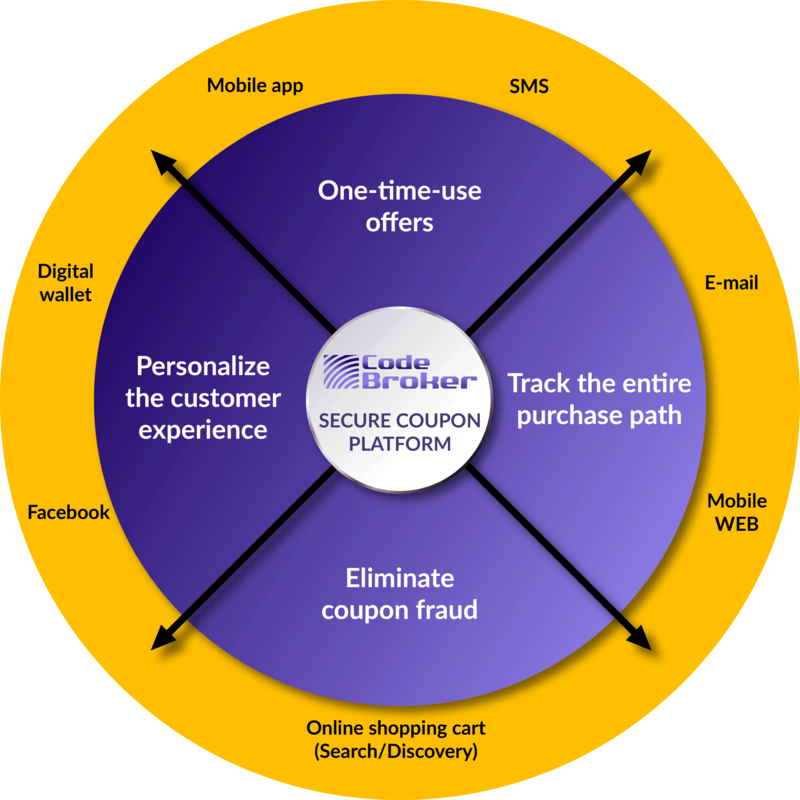 Maintain complete control over who has access to your digital coupons through CodeBroker’s anti-fraud capabilities. Using our unique security model, you can deliver rich offers to your customers ensuring they will receive and redeem only one mobile coupon. Everyone will be able to use your digital coupons as CodeBroker’s mobile barcodes have been certified to scan on more than 500 mobile devices. Complete and secure integration with mobile websites, marketing, CRM, and other enterprise systems through the use of real-time web services and batch API’s. Your information is safe and secure as the CodeBroker platform is hosted in a PCI Level I, SSAE16 compliant data center including 7 x 24 monitoring and infrastructure management. There are over 24,000 locations actively using CodeBroker’s mobile marketing platform delivering some of the most sophisticated mobile marketing solutions in the industry.